Allium sativum or “Garlic” has long known medicinal properties that have earned it the nickname of the “herbal wonder drug”. Garlic has an abundance of allicin and diallyl sulphides which are the two main medicinal ingredients. 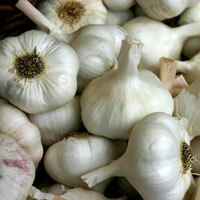 Garlic regulates the activity of the intestinal track while stimulating the digestion of food. Garlic offers positive health benefits that include supporting the condition of the heart and blood vessels.